Larimar is a rare blue to green variety of pectolite, a mineral prized mainly by specimen collectors. While pectolite may be found in several locations, including Canada, England and the U.S., larimar is found only in the Dominican Republic. This unique blue gem formed as a result of volcanic activity millions of years ago that created the Caribbean island of Hispaola. The most prized larimar exhibits sky blue color with a white pattern throughout, quite similar to the look of sunlight dancing on the floor of a pool. This gem was named by its discoverer for both his daughter, Larissa, and el mar, the sea. Appearance, RI and SG. Sometimes magnification and fluorescence might be helpful. 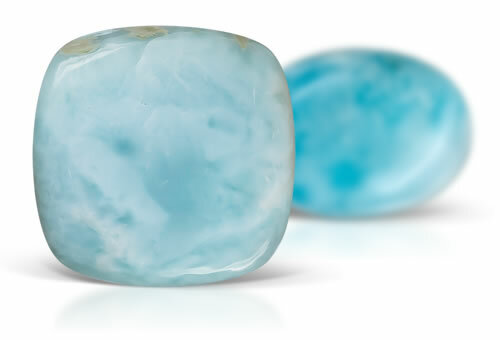 Under magnification larimar has tiny spheres that have blue center and white outer edge.